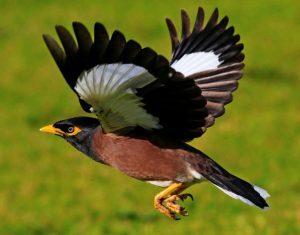 SLNC is asking everyone in Springfield Lakes to record sightings of the Common Myna (or Indian Myna) birds that are found in our region. You will need to enter the date location street, date & number sighted onto the Mynascan website. www.feralscan.org.au/mynascan Registration is free. By entering the data we will have an indication of how many birds are in our catchment and where they might be roosting. We encourage all residents in Springfield Lakes to Pick up 3 pieces of plastic litter, cans or bottles from pathways, whenever they are out walking to prevent these items from entering our waterways to keep our lakes and catchment creeks clean. SLNC is a major organiser of Clean-up Australia Day, held on the first Sunday of March each year. We also undertake another clean-up event about 6-months later. Once a month throughout the summer months, SLNC runs a Cane Toad Catching event at Spring Lake, inviting interested public to join members to catch toads and remove them from the environment – making ourselves the top predator to try and control their numbers. SLNC members train the public in toad vs native frog identification (we were trained with assistance from Ipswich City Council funding) and humane catching and euthanisation techniques. SLNC humanely catches and kills the toads, then cuts the toxin glands from the adult toads, and sends them in to the University of Queensland to be made into “Bufo baits”, that are used in Cane Toad Tadpole (toadpole) traps. Each trap can catch many hundreds of toadpoles before they grow legs and start hopping about on land. Once a quarter, SLNC hosts a spot-lighting tour of our local conservation reserve. We know it hosts BooBook Owls, Tawny Frog Mouths, Owlet Nightjars, Ring-tail Possums, Brush-tail Possums, Red-necked Wallabies & numerous frogs and spiders. In December 2017, SLNC was successful with a Lend Lease Community Grant for installing 14 Nest Boxes in the conservation Reserve. 5 glider boxes were installed, along with 2 Boobook Owl boxes, 2 Owlet Nightjar boxes, 1 micro-bat box, 2 large parrot boxes, 1 tree creeper box and 2 small parrot boxes. Wildlife Preservation Society of Queensland is monitoring these boxes to see what occupies them.